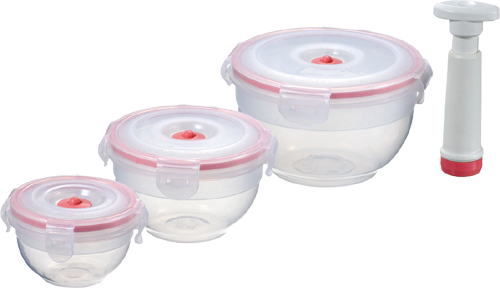 Cobb GB - Flavia Bowl Vacuumsaver 3 piece Set. 0.22L, 0.5L, 1.0L + Pump. Flavia Bowl Vacuumsaver 3 piece Set. 0.22L, 0.5L, 1.0L + Pump. The VacuumSaver defines a new generation of food saver solutions, with conveience and style.With VacuumSaver you can keep your meat,vegetables, fruits, cereals, chesse and biscuits fresher than ever. Vacuum function: upgrade to vacuum with pump, more freshness due to anti-oxidization, anti-moisture. High resistance silicone gasket provides super airtight and leak-proof barrier. Hinged design. Magical valve: enables steam to escape whenever you reheat foods. Microwave-safe: (with or without lid on).